YouTube offers enormous possibilities for professionals to raise awareness of their product, service, or specialty, create leads and generate increased traffic and engagement. It’s the second largest search engine on earth and the second largest website with people watching about 1 billion hours of video every day and boasting over 1 billion registered subscribers. Keywords Helps YouTube know what your channel is about. Headline and Description Use pertinent keywords for both. Tags Increase visibility with relevant tags for each posted video. Watchtime Your SEO increases the more time people spend watching your videos because YouTube promotes these. Engagement Comments, likes, shares, and dislikes are important. Subscribers YouTube promotes larger channels and studies the number of new subscribers that you get after watching one of your videos. YouTube’s certified management tool, TubeBuddy, can help you optimize your videos with the right tags and keywords, thanks to its SEO features like Keyword rank tracking and tag suggestions. YouTube marketing is a cost-effective form of online marketing that can help professionals reach large audiences. Video not only increases engagement with audiences and keeps them hooked to discover what will happen next, but it inspires them to take action. 70% of marketers attribute video with the majority of their conversions. With its popularity and numerous features, YouTube can help professionals interact, share and create content, and give customers an opportunity to share the word about you. YouTube features allow professionals to target viewers by interest or demographics. Advertisers pay whenever people watch their videos. You can share interesting content in a way that showcases your personality or expertise. You can encourage viewers to leave feedback and interact with you. 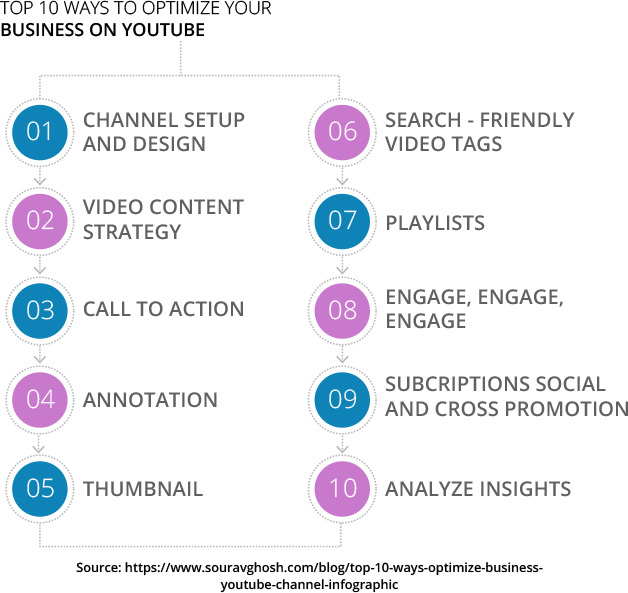 To increase your chances of making engaging, compelling videos, it’s important to know how to start a successful YouTube channel and what goes into creating widely appealing content. As a professional, you want your channel to reflect a business-like tone, and you can customize your YouTube channel accordingly. Your channel icon is linked to your brand accounts profile photo, and if you want to alter that, YouTube will direct you to update your brand account. 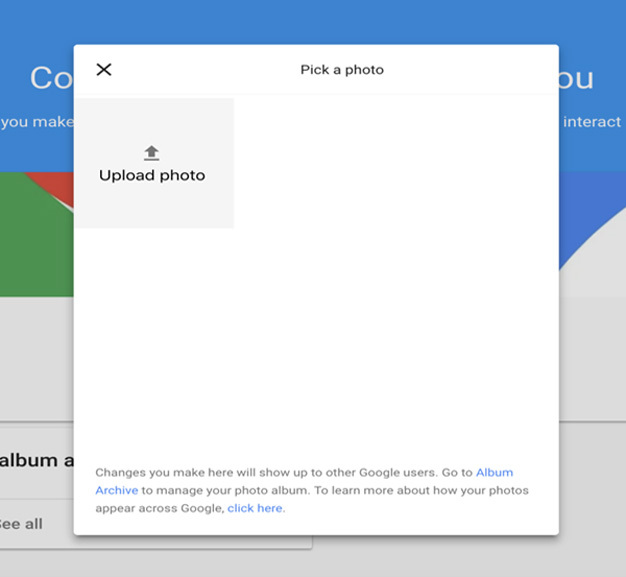 Choose “edit” to go to the upload photo seen in your brand account. The picture should be 800 x 800 pixels and a BMP, PNG, or JPEG format and check that it looks good in the smaller sizes, depending on the places that YouTube features your channel icon. Your channel icon represents you, so set the icon with your logo. Personal YouTube channels typically feature the individual’s photo, so in that instance, the icon is the profile picture. It’s also the image that appears when your channel shows up in search results. This allows you to display a more visually appealing profile on YouTube and reflects your personality. 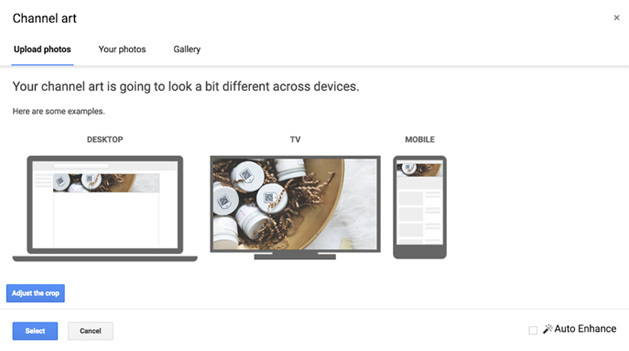 Channel art should be at least 2048 x 1152 pixels and under 4MB, but YouTube recommends 2560 x 1440 pixels for optimized results across devices. Use keywords and provide a summary of what you’re all about or offering. Include your email, and links to any social media or websites. A program like Lumen5 lets you transform a blog into a video. Moovly, Rocketium, and Widdeo offer templates and tools for user-friendly video creation. You can also use a production company to help you create a video strategy and content that helps support your professional objectives. Optimizing your content ensures that you can feature the type of information and high-quality material that gains you an audience who comes back to your channel. Educational Over the last 13 years, “How to” videos have increased 140%, so offering educational content that teaches skills can help you build trust with viewers and possibly convert them. Storytelling Communicate your image and ideas with inspirational videos that promote your professional identity and show people that they’re buying experience from you, not just a product or service. Entertainment Though you’re a professional and maybe want a professional channel, make sure that you have entertaining or fun videos that capture viewer interest. Engagement Model and Service Descriptions The text inside your description box is used by search engines to rank videos, so be sure that this is optimized with the right content including tags, captions, and titles so that you don’t lose out on valuable watch time. Keywords This is what viewers type into the search bar, so be sure to use keywords that help others find your content and are supportive of your video. Call to Action Every video should end with a call to action that encourages viewers to go to your website or contact you. YouTube Ads This ensures your content is available to audiences who might not otherwise see it. 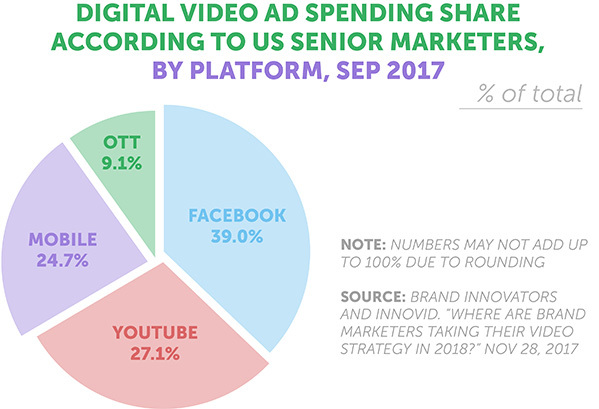 YouTube has the second highest percentage for digital video ad spending in the US. Searchable Videos Be smart about your target keywords, and conduct ongoing keyword optimization, or keyword research, to help you gain new opportunities and help grow your site traffic to generate leads. User Engagement Use Google Analytics to track keyword performance and assess the engagement level of users coming from search engines and determine if some keywords work better than others to trigger conversion. Keyword Awareness Listing up to date, popular search terms can generate an organic traffic feedback loop and help build keyword awareness. Formatting Have an eye-catching title, limited to about 60 characters, that helps people click to watch your video. Videos with an exact keyword match in the title usually have an advantage over those that don’t. Watermark This can help with your branding and needs to accurately represent your channel’s content. Be sure to be consistent with how they are featured: they need to be on all of your videos or none. Automatic Subscription Prompt Once a viewer subscribes, they can choose to be notified anytime you upload new videos, which generates instant views whenever you release content so ask viewers to subscribe and click the notification bell. Link Cards Utilize a channel card to link to your channel or use a video or playlist card to direct viewers to your other videos and playlists. End Screens These are images that appear on the last 5-20 seconds of YouTube videos and help promote other content, so use these effectively. Search Friendly Titles and Descriptions Google Trends and Google Adwords Keyword Planner helps you find the right keywords for your title and description. You can also use 15 hashtags in your video description so be sure that they hit the mark. Thumbnail Images Instead of auto-generated thumbnails, you can use a customized one to help draw in viewers. A custom thumbnail should be 1280 x 1720 pixels and under 2MB for JPG, .GIF, .BPM, and .PNG. YouTube Algorithm This is described by YouTube as “search and discovery system” and is largely based on watch time. The algorithm will increase your chances of your video being seen the more time that people spend watching your videos and the videos that you refer them to. Pricing YouTube is a free platform, but YouTube business account pricing may vary depending on if you choose to do YouTube Premium, which is $11.99 a month that enables you to stream without advertisements. YouTube is filled with success stories of individual professionals who have risen to extreme popularity and success due to clever, imaginative, and thoughtful video strategies. Their stories can help provide professionals with good ideas for a YouTube channel. Releasing YouTube videos five days a week and focusing on creating entertaining content about the beauty world helped Tati, the GlamLifeGuru, gain over 4 million subscribers, who tune in to watch honest reviews on new makeup products and unique collaborations with other YouTubers. This eventually led to the successful launch of her beauty vitamin brand, “Halo Beauty,” in 2018 and her current net worth is reported around $1.3 million. Another self-made YouTube success story, motivational speaker, actress, and rapper Lily Singh started releasing videos in 2010 and is now one of the highest paid YouTube stars with 14 million subscribers, reportedly making $7.5 million in 2016. She operates a one-woman production company and handles everything from editing, shooting, and writing herself. Controversial yet popular YouTube personality and self-made cosmetic entrepreneur Jeffree Star has a 2018 net worth of about $50 million. As of 2018, he has over 1 billion video views and 9 million subscribers who watch creative, high-quality videos about his lifestyle as well as beauty focused reviews and collaborations. A content creator, author, and artist who makes episodic content and documentary style videos about other YouTubers. As of 2018, he has 17 million subscribers and has more than 25 million views and is considered one of the top YouTube success stories. The dynamic content production helps viewers emotionally connect with the subject matter and keeps them coming back for more. In 2018, video content is the strong leader in content marketing, and YouTube is the top platform for vlogging, video marketing, and video sharing. Consumers want consistency and entertainment so that they can develop a long-term relationship with a brand or business. Viewers can be prompted to subscribe with YouTube Annotations, which lets you add text to your video that reminds them to subscribe or links in the video that viewers can directly click to subscribe. Or you can prompt them to subscribe if you feature videos where to speak directly to audiences. Collaborations can help grow your subscriber base, so if an opportunity to collaborate with another YouTuber presents itself, then you should take it to help gain a boost in your own subscriber base. Since today’s content marketing revolves around video, you need to think about creating and marketing a professional video on social media. In addition to your YouTube video strategy, you can post videos on other social media sites like Facebook, Twitter, or Instagram to draw audiences to your YouTube channel. Facebook: This highly social site has people who are predisposed to like, comment, and share posts, which helps to raise engagement levels. Instagram: With 500 million active monthly users and more than 4.2 billion likes per day, this can help you reach a wider audience and take advantage of paid advertising and segmentation options, given that it also owned by Facebook. After your video is uploaded and public, you can help it stand out by using a clickable title with relevant keywords and preparing an appealing description. This help represent your video topic so that people will click through and watch. YouTube knows what your video content is about and when it should surface as a search result, so identifying keywords and using them in your title will go a long way to help optimize your video. You only have about 55-60 characters so really try to show your videos value directly. You can help to keep users on your channel with well-designed playlists. If someone begins watching a video with your playlist, then YouTube auto-ques the next video in that playlist, which can keep users on your channel. Many people don’t know that you can trigger playlists from anywhere with a special URL. You’ve probably seen some YouTubers feature related video cards at the end of each video. According to YouTube, “top performing brands on YouTube build and promote twice as many playlists as the bottom 25%.” If you want people to keep watching, then ensure that your playlists are compelling, and the content is interesting and entertaining. Use tags, descriptions, and titles so that playlists can be discovered easily through search. Playlists also improve your ranking in YouTube algorithms. Try to stick to a schedule or specific day to have a consistent and regular presence on YouTube. Subscribers receive automatic notifications when you post new videos, and a consistent content flow helps viewers establish a routine for absorbing your content. This helps you get free YouTube views, and if you have a website or blog with a lot of traffic, embedding videos on those sites can increase views. Put the YouTube video URL in pertinent text content and ensure that the subject of your blog and the videos are similar so that it will attract niche audiences and help them engage with both your YouTube channel and blogger website. Tubefilter is a fantastic resource for YouTube creators that features the top subscribed YouTube channels. You can look for the number of comments per video, subscribers, and level of engagement. YouTube is a great place for collaborations so find a relevant creator and reach out to them for a possible partnership. Today’s audiences are frustrated with the disruptive ads and aggressively sales social network posts. As a professional, you should focus on high-quality content to market yourself. It should be valuable, easy for your audience to digest, and memorable regardless of its format. With the proliferation of video content provider channels, you will be able to bring more attention to your professional content using the impact of another collaborator. Video content providers typically work with many different clients, so they can offer exciting new ideas and creativity so that the content you produce never becomes stagnant. Stay apprised of relevant trends, so that you can continuously appeal to your target audience, and try to produce videos with a strong storytelling format that helps you connect with viewers. It never hurts to have a fresh perspective in regards to your content. Partnering with the right video content provider may allow you to perceive your offerings in a new light, and as a partner, they can help expand the creative value of your professional viewpoint. Professional video content providers usually have a keen understanding of trends and new technology and can provide expertise for your video production, as well as a lot of experience. You don’t have to worry about budgeting for infrastructure costs and the price of skilled video editors, and instead can combine your resources with a video content provider to produce a video that is professional and well received. YouTube offers the possibility of generating a substantial amount of traffic. It has a more comprehensive reach than traditional cable and television, especially considering that by 2025, it’s forecasted that half of the people under 32 years old won’t subscribe to a paid cable or TV service plan. 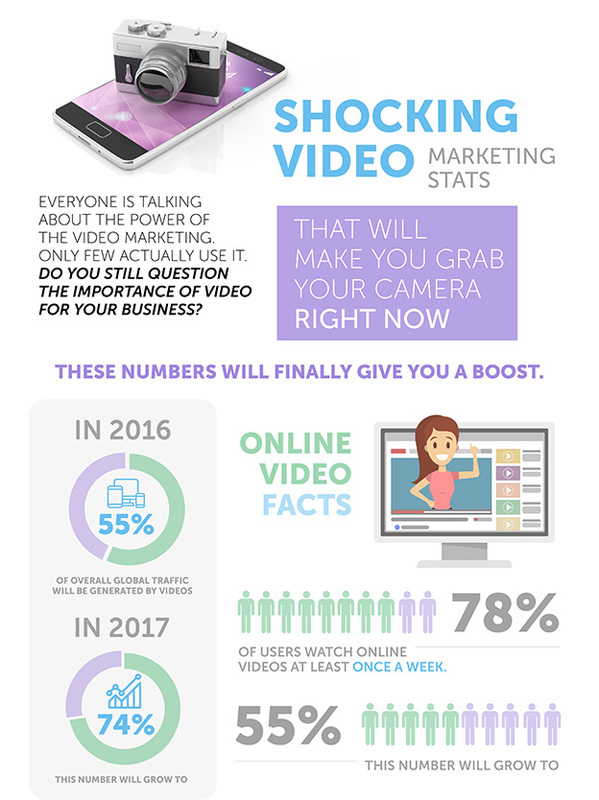 A 2018 video marketing survey indicates that 81% of businesses use videos as a marketing tool, a 63% increase from 2017. This kind of evidence is proof that video is a necessary component of any smart marketing strategy and not simply a trend. Training Video A hands-on approach to showing viewers how they can use their product or service for the most beneficial outcome. Customer Testimonials This shows how real people were able to benefit from your product or service and use it to overcome challenges. Explainer Video An easy to consume demonstration of how exactly your service or product can deal with commonly shared pain points. Webinars An informative or educational approach to specific topics that will be of interest or are helpful to your audience. People don’t have to watch them and can skip them. They are featured as either In-stream or In-display. 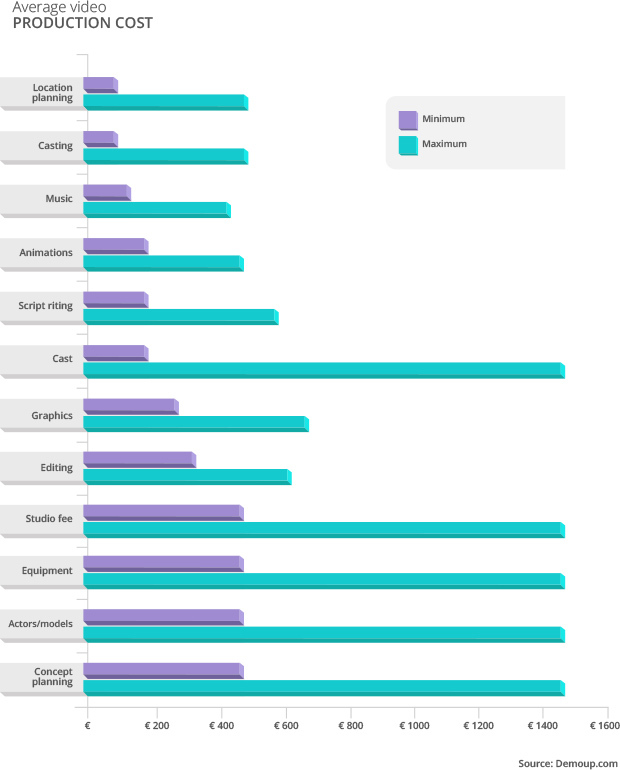 About 51% of all In-stream ads run for 15-30 seconds. They provide advertising with great benefits because you can monitor when viewers continue to watch the ad past the skipping point and see how long they watch and how often they click through. These are typically 15-20 seconds long, and viewers must watch the entire ad. These ads gain better engagement but have a higher view abandonment rate. However, if the ads are well made and well targeted, they can have a positive impact and are sometimes shared on social media for entertainment. These show up in YouTube searches with users’ organic search results. They’re not videos, they’re a thumbnail image and about three lines of advertising text and are always relevant to the users’ search. Professionals can take advantage of YouTube’s international popularity and appeal by creating a YouTube business account, and ensure that their videos are accessible to anyone, anywhere, on any device. YouTube is becoming even more popular with growing mobile usage. In fact, it’s the top App on both iOS and Android. YouTube consistently offers one of the best marketing tools available with 76 different languages and 88 countries. As a professional, your videos can take advantage of SEO boosts, increased brand awareness, diversified social reach, a stronger ability to market on a global scale while improving ROI. Remember that your video’s success is linked to its content, so focus on producing high-quality entertaining, and relevant professional YouTube channel with well-made videos Don’t forget to include the right taglines and a carefully crafted design to increase effectiveness. Market research can be another helpful factor in improving your chance of video marketing success, and the small details like infographics, illustrations, diagrams, and interactive content, can go a long way in explaining complex concepts and helping viewers move to the buying stage. Professionals rely on the global outsourcing partners at Video Caddy, who understand what you need to start a YouTube channel and help increase the likelihood of success with high-quality, well designed, and meaningful video content that captures the value of your video proposition. A cost-effective service model and customized animation, infographics, illustration, logos, and editing will make your professional videos stand out and capture the imagination of your viewers. Disclaimer:All the product names, logos, trademarks, and brand names are the property of their respective owners. All the products, services, and organization names mentioned in this page are for identification purpose only and do not imply endorsement. YouTube is one of the fastest growing online platforms today. Businesses find that it’s an ideal space to find new customers and appeal to existing ones by creating a corporate YouTube channel. The simple interface, free service model, and ability to target large-scale viewer bases makes it an extremely useful tool for all kinds of businesses. Why Create a Corporate YouTube Channel? Among the many reasons why companies choose YouTube is because it helps them connect with customers and clients while sharing information about products, services, and your brand. Features on how to use your website. Engaging customers with tutorial-style videos. How to use or order various services. Creating simple lessons for your clients. Stimulating brand appeal with funny, heart-warming, or compelling viral videos. Prompting customers to explore your offerings. The online world revolves around social media. People love liking, sharing, and posting content, and businesses are no exception. Millions of hours of pictures, music, GIFs, and videos are viewed daily, and companies who want to promote their brand and stand out from competitors use social media to leave their mark. Video quality is so critical because the wrong type of video, whether it’s grainy, unfocused, or just plain poor quality, can end up backfiring and cause loss of customers, brand integrity, or worse, become the subject of global ridicule. Video content is best left to professionals, particularly when making corporate videos. There’s trust involved in a high-quality video, and when viewers see this, they’re more likely to engage with your brand. The great thing about YouTube is that it’s actually easy to make a channel for your business. The first option you’ll notice once you’ve created your channel is a profile and channel description. You have an opportunity to describe your brand and what you’ll be featuring on your channel. You can add links to your social media, website, and other relevant sources here. Since this description is featured in numerous places on your channel, you can really let some personality shine and be smart about what you’re sharing. There is a lot of different ways to approach your video content. 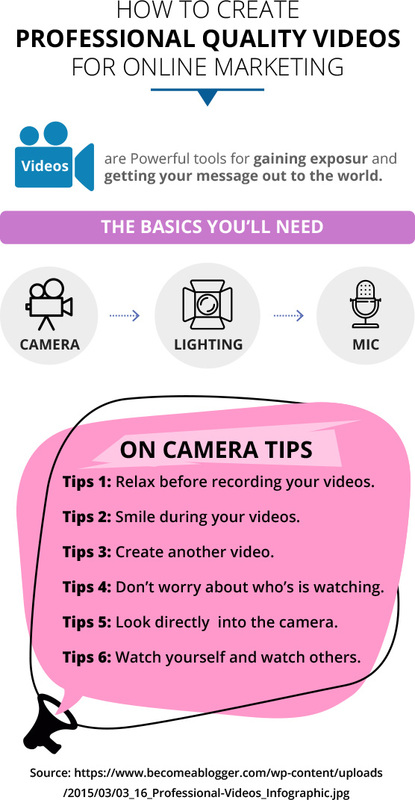 If you have a complicated product or service, and you need to educate your customers, then maybe a video tutorial is a good route to take. Or if you have a lot of glowing reviews from your customers, then testimonial videos are an option. Aim content towards a target audience or demographic. With a brief and focused trailer, you can introduce your company to new audiences and let them know what you’re all about and what content they can expect to see. Upload a professionally filmed and edited video using the “Upload” option at the top right of the screen when logging into your account. You’ll need to fill in a description, title, and tags to make sure that your video can be easily found in a YouTube search. Use keywords to describe the video and your business. A well optimized YouTube video can extend to search engines like Google, particularly because Google owns YouTube. You should share your video on your website by adding it to the homepage for visitors to see right away. Add it to a blog and share with websites describers via newsletters. Your website can also be synced with your YouTube channel. When creating a video to promote a product or service, make sure that credits are added with a URL to your website or to a site where viewers can purchase the product or service. Your product video can also be embedded in your website. As an instructional tool, YouTube videos improve customer loyalty and reduce returns and churn rates while enabling a company to enhance customer service without straining resources. “How to” videos and “Product Demo” videos allow audiences to see a product in action and are a great B2B and B2C sales and marketing tactic. 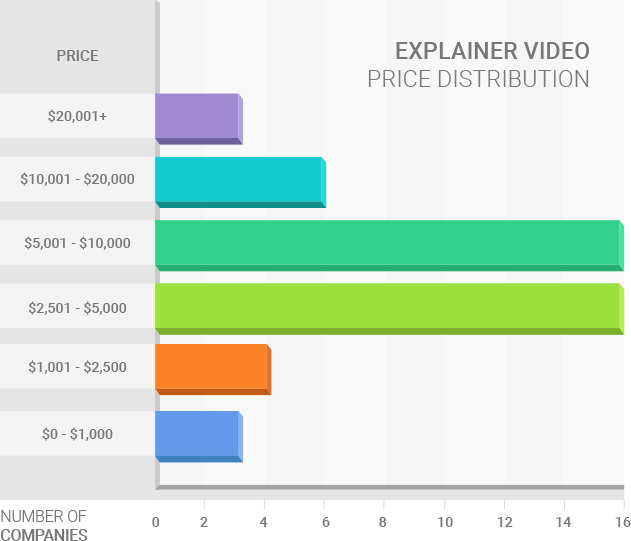 Explainer videos help businesses track interest levels by displaying the number of views on each video. Also, customers can better understand the functionality of products and services with a captivatingly designed explainer video. This type of video is widely shared and are especially useful for complex offerings. YouTube is a breeding ground for learning how to do things. “How-to” video searches have risen 140% during the last thirteen years, and businesses are seizing this opportunity to gain new audiences through new educational product content. People love inspiring videos, which is why storytelling is an effective and dynamic way to create video content and share your business’s image, brand model, and ideals. Customers want to know that they’re buying a whole experience, not just a product or service. Choose the right video for the campaign. Select where you want people to navigate to after they click on your video ad. 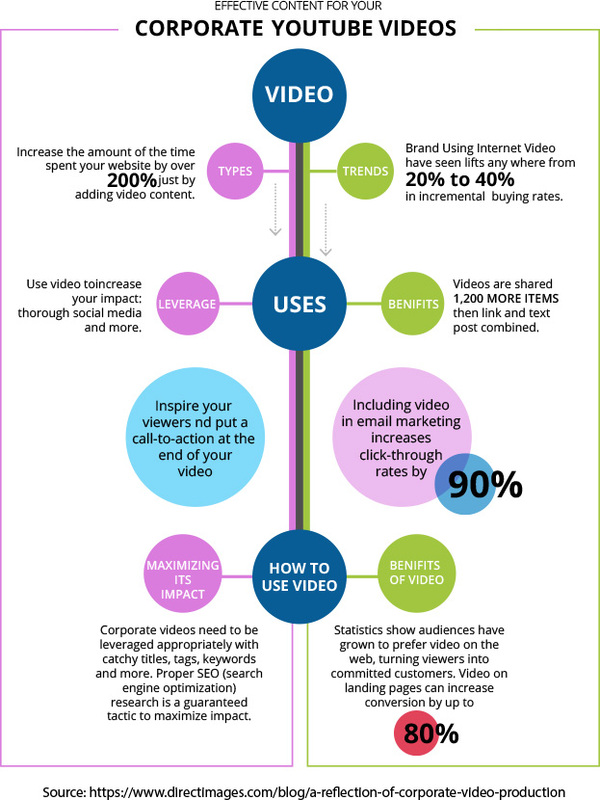 Choose an online video marketing budget. Narrow in on your target audience. Take inspiration from what’s successful on YouTube, like videos that are useful, entertaining, funny, emotional, or odd. Use keywords in the title description and tags. Select thumbnail images that attract attention. Add your URL to your video description so people can click on your link and visit your site. Use a diverse call to actions, such as prompting people to rate videos, follow your business on other social media platforms, encouraging them to subscribe, post comments, and share. Use a soft sell approach for a better customer response instead of aggressive sales pitches. Create playlists by adding your video to a new playlist and adding relevant videos from other people and choosing a catchy playlist name. Use YouTube as a social network to message and add friends, join groups, and interact with the community. As Australia’s number one ranked marketing services company and print directory publisher, Sensis engages consumers with businesses through search engine marketing and optimization services, and a digital advertising agency. An explainer video with clean, bright graphics and simple storytelling humanized Sensis and easily described how they help small businesses. California based Facebook is an online social networking and social media service that’s accessible across a large range of channels and networks. Nostalgic cartoon-style animation and a straightforward approach to explanation allowed audiences to see how businesses can use Facebook marketing. As the world’s largest beverage company, Coca-Cola features 3,900 beverage options. To celebrate their 100th anniversary, they searched for people creating happy moments online and spreading it. A vivid, minimal color palette and infographics supported the storytelling techniques, captivating viewers with a positive message. The goal of creating a successful corporate video is to generate connections with long-term clients. However, this objective can quickly dissolve with even the simplest mistake. This is why quality production is such a powerful, valuable ingredient in a successful, well-received corporate video. Avoid including too much information and get right to the point. Videos that last between 30-90 seconds generally garner the most views. Improve engagement levels by focusing on fulfilling the need for instant gratification; keep your corporate video targeted around a single idea. Using a DSLR camera can produce high-quality content and resolution. Music can really set the tone but avoid using genres that are distracting or that will create copyright issues or social conflicts. Final Cut Pro is a great editing program for video footage but can be costly. Corporate videos are not conventional video advertising, so reaching for broad appeal and general audience viewership isn’t the intention. Focus on explaining your objective to a target demographic. You’re not going to win over audiences or maintain interest unless the design is exciting, polished, and provides a true experience. Don’t forget the who, what, where, when, and why. Highlight your brand accomplishments, strengths, and liberally incorporate slogans, logo, brand color schemes, and products. Color correction and grading can be a huge benefit for corporate videos, so utilize programs like Red Giant’s Magic Bullet or Davinci Resolve. Filters can alter color palettes and act as a storytelling propellant, setting the tone for your message. Warm colors can be happy and uplifting, or foreboding warnings, so pay attention to tone and filtering. Color can be utilized to make an object pop by using a masking technique that eliminates surrounding color, so the figure or object stands out. Logos present your company’s first impression to viewers. Professional logos require effort and expense and add a level of seriousness to your channel. Memorable logos differentiate your channel from competitors. 40% of people believe that logos reflect a direct association with industry, so a proper YouTube logo is key. When creating a dynamic and compelling corporate video, thought needs to be given to the creation process, editing, and post-production up until you deploy your publishing strategy on YouTube. Be sure that your corporate videos are distinct to the specific audience they’re intended to serve, whether its obtaining new clients, introducing customers to your new employees, promoting products and services, or generating brand awareness. Generating trust with customers and showcasing your company’s value can be done most effectively with customer testimonials. Employee testimonials serve as an efficient way to recruit new personnel and create a sense of inclusion and brand familiarity. Short documentary style corporate videos featuring an important client discussing your product are another popular method of highlighting industry expertise and inspiring trust. Following a decision of what the video’s main goal is, your business should decide which company representatives should provide video input, and what other resources might be helpful, such as third-party clients, and a specific budget or time frame. Don’t attempt to create the video alone because a successful video usually involves an entire team with unique insights to share. Every story is distinct, and not all are equal, so each of your videos needs to have a strong purpose. The intent is important; some videos might be intended to produce an emotional reaction from your audience and create a sense of nostalgia. Others might be funny and intended to gain a humorous response. Quality videos take time and money to produce, so while you are planning your video, think about the story you would like to tell and choose the strongest of them to produce. Once your video has been created and produced it’s ready to be shared, and this requires an effective, intelligent launch plan. Don’t become so wrapped up in production and post-production processes that marketing and distribution strategies fall by the wayside. YouTube is an ideal platform for hosting your video because aside from being the most popular video hosting site, it’s second only to Google for the most popular search engine. Promotional strategies are even more crucial than a hosting platform. Spread awareness to your videos through social media like Twitter, Facebook, and your company website, blog, and email campaigns. However, make sure that you’re not spamming customers. Consider pitching your videos to a variety of publications that can help people learn more about your company. This includes all of your pre-production components like organizing resources, compiling footage, syncing audio and camera’s, and preparing everything for edit. During this stage, the story is a mere outline for what it will later become. Though this raw layout might be difficult to share with clients because it doesn’t look polished, it saves time in the long run so you can work out details before further production processes occur. Only move to the next stage after sharing and receiving feedback on all of the components and before adding in transitions, B-roll, and other elements. During this stage, the video will gain more professional polishing through editing skills that impact the script and the laid out elements. Decisions are made on which should be used and which should be stitched together. Blank spaces and pauses are removed and edited so that the video seamlessly integrates with music. Picture and sound locks should be wrapped up without maxing out render times with altered footage and audio. This stage should be the most simple to finish because the video has been given the go-ahead and you’re now able to add color correction, stabilization, and lens flares. A full export can be done instead of a quick review cut. Save editing time by dropping footage to the same layer if using Premiere Pro and conduct final audio sweep and add animations to text, along with infographics. Incorporates planning, research, and organization to help the video be successful. Includes video strategy, budget, story, timeline, script development, voice or acting talent, characters, equipment, location, and production team. All the raw materials for the final video are acquired in this phase. Specific project ideas, visuals, or overall vision should be communicated to the video producer. This stage includes performing interviews, recording voice-overs (if needed), capturing B-roll, and setting up equipment. Producers and editors assemble the story components and video editing is conducted to bring the entire video together. This includes music choices, video editing, logging interviews, producing a final story, gaining feedback and approval, and final delivery. Good lighting is very advantageous and is an important part of a quality video. At the very least, a large-scale lighting source should be used. Always invest in a high-quality mic because the sound quality is a vital factor in appealing videos. Use an intuitive program such as Adobe Premiere, iMovie, or Final Cut Pro. Learning some basics of editing theory may be helpful. High-quality videos can equal lots of subscribers, so create as polished a video as possible. You may have to table some production specifics if the quantity is more important to you than quality, so allocating resources to some areas over others can still help you maintain decent quality. Designed for fast edits that don’t demand a lot of technical proficiency or video editing skills. This is a solid choice for beginners and casual video editors. It has a simple interface that can produce high-quality videos. However, it does not include many advanced features. Features basic video editing components with a few special editing supports, like paint effects. This interface is user-friendly and can import video files from a hard drive. Tiles, music, effects, and themes can be added along with basic enhancement features. This popular software is known for its high-end editing capabilities and is a favorite amongst industry professionals. Adopting some best practices can give your business a better chance to create truly appealing and highly engaging corporate videos. Choose the best distribution channels for your content, including those apart from YouTube. Repurpose your content to get the most out of your investment, such as reusing certain content elements across different platforms. Consider that the average ROI for corporate videos is higher than other marketing methods. Make sure your content is truly meaningful and captivating for audiences so that there’s value to be obtained from watching it. Add your own unique flavor with high-quality effects like thoughtful audio, music, or camera aesthetics. Don’t be afraid to emblazon your branding components throughout your video, including icons, logo, and messages. Emotional connections with audiences are key because people will remember how they felt more than anything else. Don’t overload your audience; be succinct. Remember that the average attention span is about 8 seconds, so keep your length less than 2.5 minutes. Small businesses and entrepreneurs alike have found success on YouTube with marketing videos. Certain YouTube channels can be a very educative format for businesses and entrepreneurs to learn from their peers and other business leaders. Ted Talks People prefer watching videos and opposed to text and can learn more from viewing it. Video content comprised 74% of online traffic in 2017. EntrepreneurThis centers around big business trends, ideas, and advice specifically for small business owners and entrepreneurs and also features news, expert advice, and industry-wide interviews. Gary Vaynerchuk This channel showcases advice from the CEO and founder of VaynerMedia and is a favorite amongst business leaders and entrepreneurs. Content Marketing Institute (CMI)Provides insight for entrepreneurs who want to learn about marketing strategies, CMI stresses the impact of branding and storytelling and features brief videos. A study of 3,000 US campaigns examined how the total reach of millennials would be affected if campaigns replaced their TV advertising strategies with YouTube ads instead. Without spending any extra money, 46% of the campaigns would have benefited from a combination of both YouTube and TV and an increase in the millennial impact of 42% compared to just TV. Brands need to shift their resources to a corporate YouTube channel to generate proven brand awareness that resonates with target audiences. TrueView ads, which are YouTube’s skippable ad format, allows viewers to either watch an ad to completion or skip. Results for 89 U.S. brands revealed that viewers who watched an entire TrueView ad were 23 times more likely to visit and subscribe to a brand channel, watch more video content by the brand, and share brand videos. Viewers who were minimally exposed to TrueView ads were still ten times more likely to complete one of the above actions. 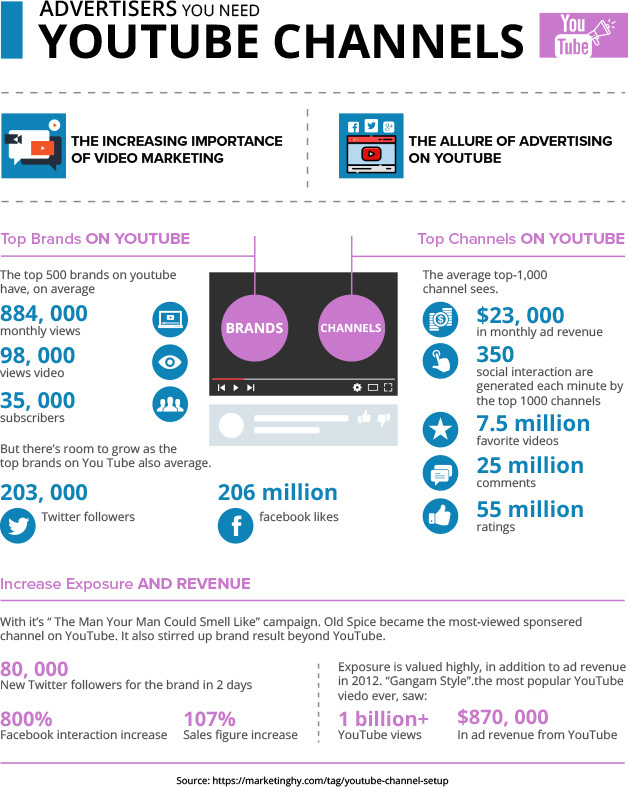 YouTube has become the most powerful format to promote business content and increase brand engagement. Creating a corporate YouTube channel can be a guaranteed successful tool in the arsenal of a business’s marketing and sales strategies if companies focus their video production campaigns in an intelligent and effective route, and take care to produce and launch high quality, meaningful videos to a key audience. Compelling corporate videos requires a video production agency with the passion, professionalism, experience, and technology to set trends in the business world. Video Caddy has provided best-in-class international support for corporate video production for small businesses, entrepreneurs, and Fortune 500 C-level executives. Video Caddy helps companies create engaging, stimulating, and purposeful video content with a matrix of video editing, animation, storyboarding, and character creation. Launch your corporate YouTube Channel with the support of a trusted outsourcing team and reach your marketing goals. By 2021, 82% of internet traffic will be video. The popularity and appeal of video are here to stay and has changed the course of popular sites like Facebook, Twitter, and Instagram, who are altering their format to accommodate the popularity of videos. Half a billion people watch videos on Facebook every day and in 2017 Facebook increased the length of their videos and live streaming on Instagram became a huge favorite amongst users. Businesses have been quick to respond to this worldwide and pervasive format by combining it with their ads and centering marketing strategies around videos. The creativity and imaginative ways that videos can be applied to entice, seduce, appeal, and connect with consumers have left video marketers achieving significant increases in brand awareness and gaining more qualified leads per year, 54%, and 66% respectively according to Aberdeen. Where live videos can ultimately be limiting and expensive, animation has been the real meat and bones of video marketing campaigns because of the diverse and exciting range of styles that can be used to hammer in the nail of a brand message. 2D Animation2D Animation, or Two-Dimensional Animation, focus on story, character, and settings in two-dimensional spaces. It is often called traditional animation. Examples include tv favorites like The Simpsons or a Disney classic movie like Snow White. 3D Animation3D animation, or Three-Dimensional Animation, has depth and realism, and 3D modeled characters, settings, and environments. Examples of this type of character animation include movies like Shrek or Toy Story. Motion Graphics This is an animation format that features moving animated imagery, often colorful graphs and charts, and a simplified animation style. Examples include the opening titles to popular tv shows like Marvel’s Jessica Jones and movie favorites like Guardians of the Galaxy’s title sequences. Whiteboard AnimationA mixture of high-quality sound with illustrations that are created as the viewer watches it, which makes even the most complex or boring subject matter interesting for audiences. It is typically black and white with some colors. Kinetic Typography AnimationA combination of motion graphics and text that has a dynamic and modern feel. One of the most famous examples of kinetic typography is in the opening sequence of the all the Star Wars movies. 2D animation is a faster alternative to its 3D counterpart and is a very adaptable format for creating animated videos. It enables businesses to deliver direct messages, products, or services to customers through a 2D animated depiction. 2D animation gives videos lucidity and can be tailored with a great degree of options to customize your company’s message. The nostalgic and childlike nature of 2D animation is very universally loved and appealing, as well. ROI Video is identified by leading global marketers as the content format with the best ROI. into Conversion After viewing a brand’s videos on social media, 64% of consumers move on to the purchasing phase. Branding Businesses have the power to make a lasting impression with animated videos since over 80% of users can recall and remember a video ad they’ve seen over the last 30 days. Business Initiatives Companies who want an inexpensive, yet attention-grabbing animation style, use this format for appealing to new customers and prospects, capturing mobile audiences, building trust, and effectively explaining new products and services. Google’s 2D animated video about the cloud has garnered almost 100K views in 2 months since April 2018 and educated about the infrastructure behind the Google cloud. The minimal, non-extravagant usage of 2D animated techniques underlines the informative quality of their message. Challenges: Distracting imagery, overly complicated animations, lack of a connection between message and video, and not portraying human or animal characters with enough realism in movement sequences, gravity effects, and expression, can pose challenges in 2D animation. 3D animations are truly compelling and visually dynamic and offer a lot of room for complex detail and superior levels of realism, even with imaginative characters not based on existing human or animal forms. They have the potential to look very expensive and rich and bring life to marketing and sales videos. They’re extremely attention-grabbing and popular amongst viewers and can make businesses stand out as a unique entity amongst competitors. 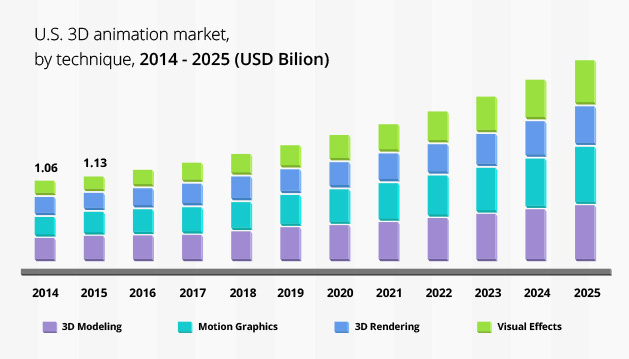 ROI For the overall 3D animation market, 3D modeling is predicted to comprise 30% of the overall revenue share by 2025. Businesses can use 3D animation as a lucrative investment in their image, brand portrayal, and ROI. into Conversion Videos featured on a landing page can increase conversions by at least 80%. Branding 3D videos can provide up to a 157% increase in organic traffic from SERPs, which helps businesses reach new audiences more quickly and expand their brand’s reach. Business Initiatives Businesses can use 3D animation to showcase their products and services and attract new customers with a flashy format. It also gives companies the opportunity to feature their business vision. Gatorade’s 3D animated video starring Argentine footballer, Lionel Messi, has accumulated over 12 million views in a just few short weeks of its release. The poignant storytelling narrative, positive message, and copious product placement has really appealed to longtime fans and new customers alike and is a perfect example of how powerful this animation format can be. Challenges: This form of animation requires top-notch technology so as not to risk looking outdated or low quality. Businesses need to be careful of delivering a message or story without getting swept away with too many effects. 3D animation is more complicated to produce and generally is associated with higher costs. When businesses need to take a dry subject, like educating employees on new policies, for example, this type of animation that can effectively communicate information, displaying statistics, charts, or facts, in a really interesting and appealing way. Its flexibility and easy integration with all kinds of different video styles, and reliance on colorful graphics make this a well-loved format. ROI It gives businesses a more effective medium for educating, informing, and sharing important data with their customer base, which in turn leads to more purchasing behavior. into Conversion For example, retailers can use motion graphic to encourage customers to visit their website, purchase a product, and even be encouraged to order more or repeat products. Likewise, service providers can tell a story about their brand, improving interaction levels with audiences at a faster rate. It can strengthen your SEO ranking because customers will see it on the first page of search results when using specific keywords. Branding Marketers can use this format as a technique for strengthening product branding, or to feature product promotions. The versatility of this format enables businesses to adapt depending on demographics or target audience base. Business Initiatives The storytelling format and imaginative imagery of this style is a powerful support for businesses whose objective is to increase awareness of products or services, enhance SEO, develop brand recognition, or enhance their impact on social media. If your company has a lot of hard facts or statistics, then this can directly deliver data without losing appeal. Deloitte used high-quality motion graphics to illustrate complex information into an easily understandable and engaging format with their Digital Democracy Survey. The video features information about Millenials in a quickly absorbed way, despite the amount of information included. Challenges: If the graphics get too over the top or cluttered, or too ambitious, then businesses run the risk of the core message or content getting lost in the animation. If a business has a training session that really needs to hit home with employees or personnel or needs to convey a message to a very niche viewer base, then this is a straightforward, concise, and budget-friendly choice. This format is typically black and white and helps provide a clear and simple narrative. For example, if your business wants to describe a new service in an easily understandable way, this animation form works well. ROI Businesses can benefit from a direct impact on their ROI as 90% of business users have revealed that product animation videos aid in decision making. into Conversion Reduces website bounce rates, generates new traffic, and higher call to action ratios and click through rate (CTR’s). Branding Dr. Richard Wiseman shows evidence of the ability for Whiteboard animation to help viewers gain a 15% increase in knowledge retention. Business Initiatives It’s a clear format that has become an increasingly popular way for businesses to explain products, services, or complex facts. 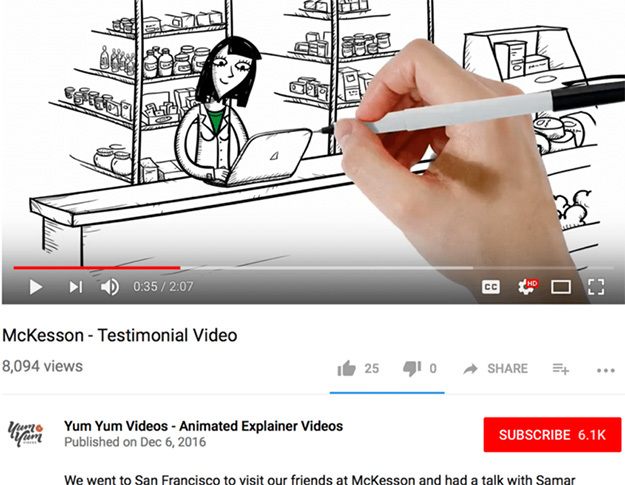 Coca-Cola used whiteboard animation as an internal explainer video to be used for marketing, sales, and HR onboarding and corporate training, which has gained over 600k YouTube views. Challenges: Black and white can be very limiting sometimes, so it’s important to be creative enough where you are not going to bore your viewers or be too simplistic to actually engage audiences. This style combines motion and text to share messages or influence audiences or clients. Businesses rely on this to present stylized and rich content or messages for landing pages or ads. It’s particularly attractive in sharing updates about products and services, or brand developments, and there’s no limit to the complexity that can be used in the design. ROI Marketing campaigns are supplemented with the ability to tailor customer messages, email campaigns, and social media marketing campaigns that affect company sales. 78% of marketers state that video provides a solid ROI. into Conversion Customers can be encouraged to move from the consideration stage to make a purchase after watching an animated video, considering that 64% of those surveyed are likely to purchase products and services online after seeing a video. Branding Artistic text and motion graphics can really make logos, products, and services pop. With some creative color palettes and fonts, businesses can convey strong, memorable messages in a very short amount of time. Business InitiativesWith the capability to showcase messages through text, companies have the opportunity to directly impact customers and clients by directing their attention to product messages, services, and promotions. PayPal featured Kinetic Typography in explainer videos for both Australian and American audiences in their “How PayPal Works” campaign. The basic color palette and straight to the point format style helped them educate people on the safety, speed, and other highlights of their service. Challenges: The reliance on text and numerical characters can run the risk of appearing old-fashioned, out of context, or too slow. It is important to deliver a message clearly and smartly so that it can be understood. To use a familiar Hollywood catchphrase: “let’s go behind the scenes” for a moment and take a deeper look into the expenses involved in creating animated content. While there are industry averages, pricing depends on the experience of the studio, the types of animation, video editing, pre and post production fees, extra equipment, actors (live or voice-over), pricing, and timeline. Overall Cost: Expect to pay anywhere between $5K-$30K per minute for any high-quality animated video, which incorporates the video length and style, sound design, script and storyboard, research, and animation. Length: Studios typically charge on a per minute basis, so length will significantly impact pricing. 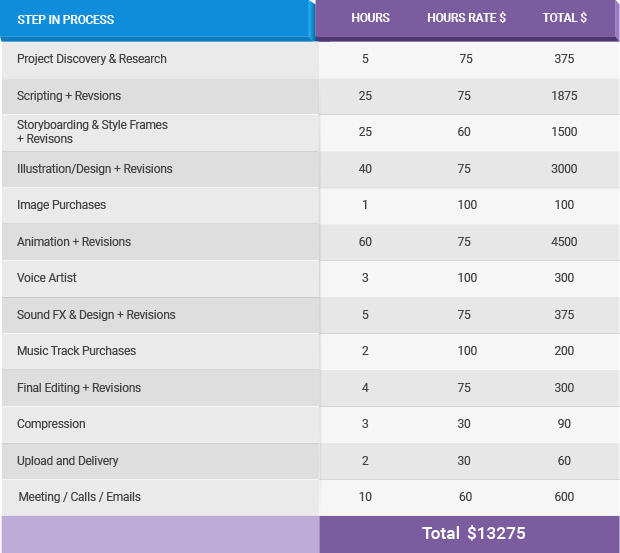 Illustration: Illustrators often charge anywhere between $25-$100 per hour and average costs for illustration projects in the US can range between $90-$500 for smaller projects, and more complex projects can run into the several thousand depending on project timeline, length, and revision cycles. Motion Graphics Editor: Anywhere between $600-30K for a flat rate fee. Sound Technician: $300-$700 per day. Script: For an experienced scriptwriter through an accredited studio, pricing averages about $261 to about $2,615 for a 60-second explainer video. Professional animation studies in China and India are becoming increasingly popular partners for studios in Europe, US, and Japan. The flexibility of working with smaller and more inexpensive studios in Asia, as well as the fresh, creative perspective that these countries bring, has a very appealing factor for larger studios and businesses alike. The global animation industry was worth $254 billion in 2017 and is projected to reach 270 billion by 2020. These numbers are due to the pervasive usage of videos on the internet, and the widespread access to multimedia devices. The US market for 3D animation is growing, as seen in the chart below. Propelled by new technological advances and increasing multi-industry demand, particularly entertainment and media. 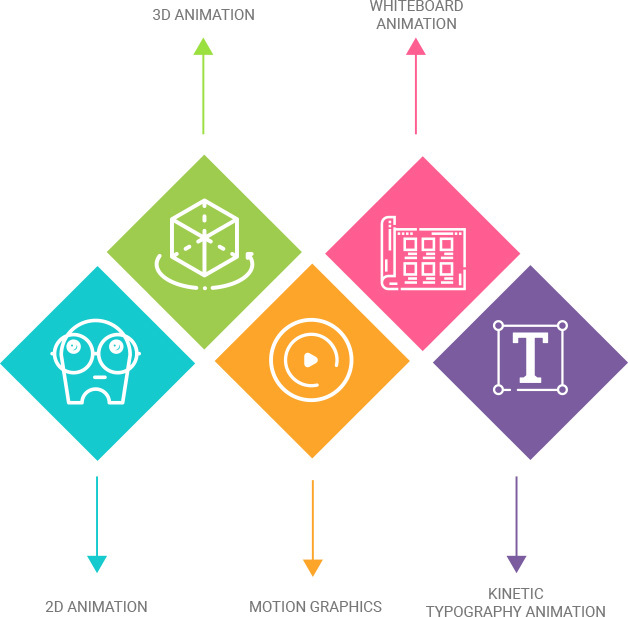 Singapore, India, and China are also major players in global animation market growth due to a combination of skills, experience, and lower production costs for animation. The average reputable, accredited animated or digital content production studio charges anywhere between $700 to $1000 as a starting price for custom animation projects. 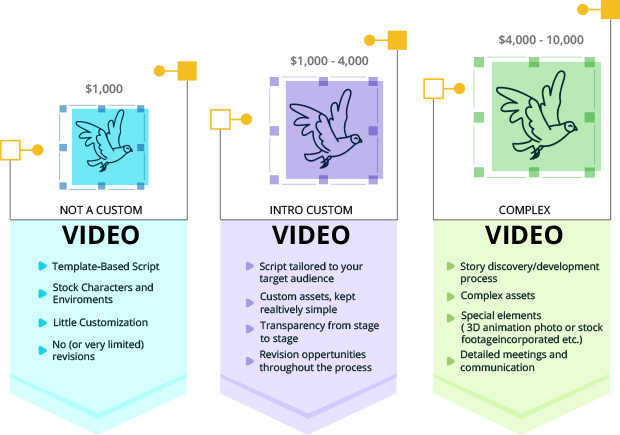 To contract an accredited animated or digital content production studio in the UK, you can expect to pay an average of $7,972 for a 60-second basic explainer video package, or about €6,500 or £5,700. 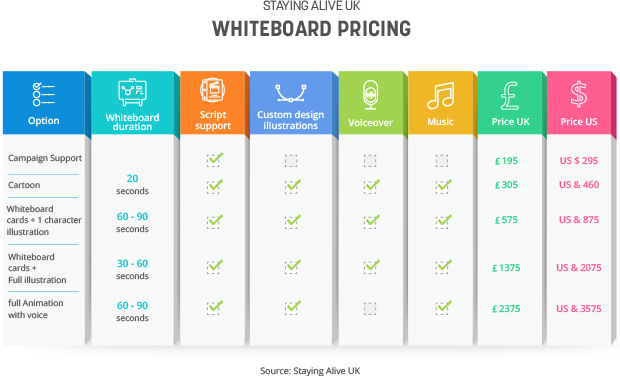 The chart below displays the pricing model ranges for animated explainer videos based on a survey of UK companies. 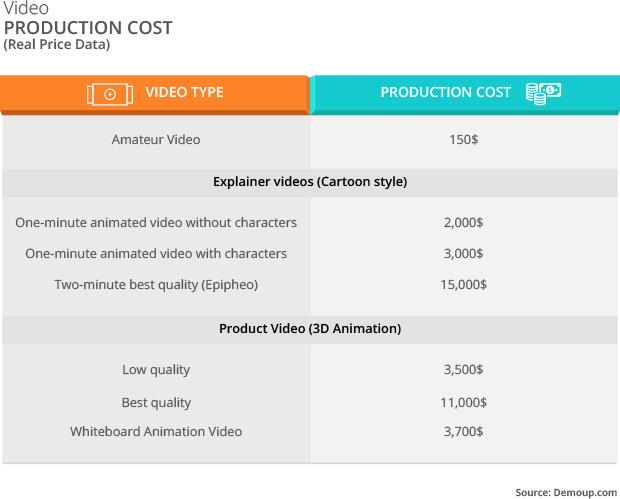 For animated videos from accredited digital content firms, pricing ranges fall between $25 to $40 per second on average for 2D and 3D animation. $300-$20K per minute depending on 2D, 3D, and studio type and precise location. €200-€15K per minute depending on 2D, 3D, and studio type and precise location. Customized animated videos for business is not only the future; it’s the now. By 2021, 82% of all internet traffic will be video. Changing technologies embedded into our operating systems on phones and mobile devices are altering consumer perceptions and experiences with video. Businesses need to not only respond to this evolving demand for fast, tailored ads, marketing campaigns, promotional content, and training seminars, but be bold and aggressive in delivering what consumers and audiences want. Video Caddy’s experience in animation and extensive video animation services, gives us the ability to translate brand and business messages into visually stunning animated video content that resonates with viewers, consumers, and targeted audiences.